Help Net Security claimed that jQuery.com was compromised and serving malware. Ralph Whitbeck of the jQuery team quickly followed up to clarify that ‘At no time have the hosted jQuery libraries been compromised.’ but a different compromise the next day led to the site being moved. In every IT environment, the risk of downtime rearing its ugly, and costly, head is an ever-present threat. 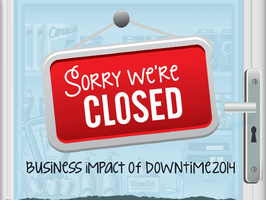 Last year, businesses lost over $46 million to downtime-related expenses. This infographic examines how costly outages could be for your industry and how to keep downtime from impacting your bottom line. Flux is the application architecture that Facebook uses to build web applications with React, and this is a look at how to do formal unit testing of Flux applications with Jest, Facebook’s auto-mocking testing framework. npm 2 is out and Forrest L Norvell provides some background to the version bump and the semantic versioning background here. This and more Node news in this week's Node Weekly. Raymond Camden reports that the implementation of IndexedDB added to Safari on iOS 8 has an significant issue related to primary keys. 0.9.3 followed quickly with less significant, packaging system oriented, updates. A Node-based, backend agnostic asset pipeline, supporting constant-time rebuilds and compact build definitions.